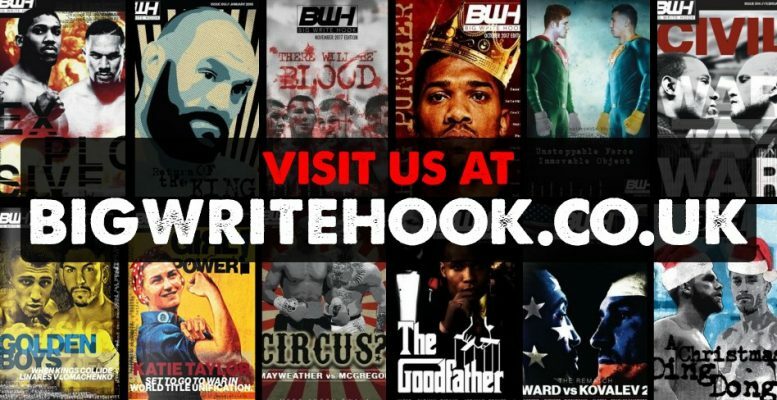 Big Write Hook Boxing Magazine Goes From Amateur To Pro! Big Write Hook is a new quarterly boxing magazine which debates the biggest issues in the sport from serious topics like mental health to the more trivial things like social media. BWH is also commitment to worthy causes with dedicated pages to raising awareness for autism, addiction and male suicide, among other featured charities. Originally created as a passion project 3 years ago, it has grown in popularity; going from a bedroom blog to a professionally designed monthly e-magazine in that time. Now, after winning investment in a Dragon’s Den style business pitch, founder and Editor in Chief, Lewis Calvert is looking to take the mag from a hobby to a full time business. Monday 6th of August sees the launch of their new website: www.bigwritehook.co.uk and pre-orders of the magazine can be made now with 10 free t-shirts to be given away to people who order early. “People aren’t reading the news because it’s depressing. We’re sick of hearing about Trump and Brexit. That’s why I love sport and boxing so much. There is none of that. And even though everyone is still using their phone these days, I think there is room in people’s lives for a printed mag. Just like the way vinyl records have come back into fashion, we can do that… only we’re less hipster. The brand gathers writers from all over the country including sports journalists, published authors and writing students, but they are very proud to provide a platform for many first time writers too; publishing no fewer than 20 pieces for first timers over the past 18 months. But how the pages look is just as important as the words within it. Ryan Wilson, the magazine designer, said: “To have the creative freedom to put something like this together is amazing. It is so original. It’s got graffiti and grunge vibes, comic book styles and other little secrets that are just too unconventional for mainstream print. But that’s what makes us unique. Big Write Hook knows it does not have the financial muscle, resources or networking power of the bigger boys out there, but if they are your Anthony Joshua or Tyson Fury, BWH is hoping to be your Tommy Coyle or Dave Allen. With the support of boxing fans around the country, they are just looking to see how far they can go and would love you in their corner.